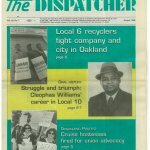 The latest episode of the Labor Archives of Washington’s regular segment on the KSVR radio show We Do the Work is now streaming online via KSVR and Public Radio International’s Exchange. Advocacy activities articulating the value of archives can be an important component of inreach and outreach activities. Effective advocacy requires that archivists make consistent and explicit arguments for the value of our collections. The Kheel Center for Labor-Management Documentation and Archives in Cornell University’s ILR School is pleased to announce the digitization of over 2800 collective bargaining agreements (CBAs) which are freely available via Catherwood Library’s open access institutional repository [email protected]. In 1937, United Auto Workers Local 174 sponsored the creation of a series of murals to enliven their Union Hall and celebrate their rich, if relatively young, history. 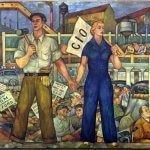 The resulting work proved to be one of the most memorable pieces of Detroit’s New Deal-era artwork. In the February-March 2016 issue of Labor, under LAWCHA Watch, John W. McKerley and Jennifer Sherer write that multiple generations of labor scholars, labor educators, unionists, students, and others have benefited greatly from the recordings collected by the Iowa Labor History Oral Project (ILHOP). Every year the Labor Archives of Washington at the University of Washington Libraries Special Collections works with National History Day students on their projects. This year, students Ashley Luty, Ananya Jain, and Eileen Zhang placed 1st in Washington State for the Junior Group Documentary category for their film “A Wave of Change: The 1934 West Coast Waterfront Strike.” The documentary employed the Labor Archives’ collections and included interviews with LAW Labor Archivist Conor Casey. 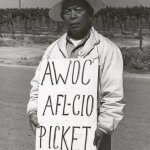 The Reuther Library is pleased to announce the digitization of over 100 reel-to-reel audio recordings related to the Agricultural Workers Organizing Committee (AWOC). Before 1955, the AFL (American Federation of Labor) and the CIO (Congress of Industrial Organizations) were separate, competing organizations. 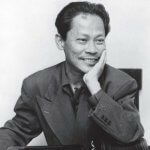 The two organizations chose to merge in 1955 to strengthen the labor movement and help eliminate competition between unions and workers. 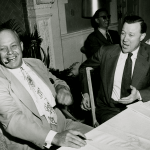 From the Special Collections and University Archives at the University of Maryland, this collection is a “behind the scenes” look at the logistics involved in working out the details of the merger. Originally posted October 16th, 2014. Written by Dallas Pillen, Archives Technician at the Walter P. Reuther Library, Archives of Labor and Urban Affairs, Wayne State University. 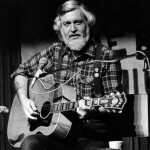 Bruce Duncan “Utah” Phillips (1935-2008) was one of the most prominent members of the American folk community in the latter half of the 20th century.